A short but sweet Bundesliga Show this week. Jon Hartley and Matt Hermann wrap up what happened in Germany’s World Cup qualifiers and look ahead to the matchday 3 in the league. Back for another packed Bundesliga Show is Matt Hermann and Jon Hartley. In this weeks episode, all the best and the worst from matchday 2, and ask the question ‘which teams are and aren’t looking forward to the international break?’. In the first of a three-part series looking at German triumphs in the European Championships ahead of this summer’s tournament, Kyle Barber harks back to one of the most impressive national line-ups in history. Maier, Breitner, Beckenbauer, Netzer and the eponymous Gerd Müller: some of the most lauded and recognisable names of German footballing history, and all synonymous with success. Having forged such reputations over the five or so years which preceded the 1972 European Championships, returning from Belgium with the trophy aloft both cemented their collective place in the annuls, and paved the way for the future. Played out over an 18-month group league phase, followed by two-legged quarter finals and then the semi-finals and final, the format of Euro ’72 was somewhat different to the two-week setup of this year’s extrav. Of course at that time,Germany was still very much a divided nation. And while West Germany enjoyed a fairly routine passage through the league stage – topping their group with an unbeaten record (four wins and two draws, from games with Poland,Turkey and Albania) – their neighbours fared less well. Drawn with the imposing Yugoslavs and free-scoring Dutch (and whipping-boys,Luxembourg),East Germany were always likely to face a tough task to secure qualification (with only one team from each group progressing to the last eight). Thus it proved, as an opening run of three wins was overshadowed by two losses and a draw, leaving the side in third spot, two points behind group winners Yugoslavia. The quarter-final line-up shaped up with Italy playing off with Belgium, Hungary taking on Romania, Yugoslavia facing the USSR, and West Germany drawn against England. It is generally regarded that a good deal of the self-belief engendered in the West German side of the 1970s had been generated a little over four years before the 1972 Final; through a 1-0 friendly win over World Champions England in Hanover. Harking back to his solitary strike that decided the game, Franz Beckenbauer would later proclaim: “It was the first time in history we had beaten the English. That was when we realised we could, and [we] lost some of the respect we had [for them]”. Cast forward to 1970, and that confidence was reinforced as the two squared off in the World Cup quarter-final; this time with the Germans coming from two goals to take the victory 3-2. Now they would do battle once more, this time over the course of two legs. The first leg saw the two teams returning to the hallowed Wembley turf. On a floodlit, damp late-April evening, the away side confirmed that the tide had fundamentally turned in their favour, producing a stirring, fluid display to comprehensively wash their hosts aside. In front of a crowd of 96,800, the West Germans took the lead through Uli Hoeneβ after 26 minutes, yet failed to reinforce their dominance, and England’s equaliser came courtesy of Franny Lee’s 77th minute tap-in. Eight minutes later, Bobby Moore mistimed a challenge on Siegfried Held, bringing the wideman crashing to the floor. Up stepped Günter Netze to drive the resulting penalty just beyond Gordan Banks, before ‘Der Bomber’ all but finished the tie three minutes later, beating six England defenders in the process. The post-match clamour that followed the away side’s performance was typified by L’Equipe’s proclamation of “football from the year 2000”, lending it an extra, ethereal quality. The second leg was something of a non-entity in all honesty, as the two teams played out a lacklustre goalless draw in Berlin’s Olympiastadion. Nonetheless,West Germany’s stock was rising, and their status on the global stage had been noted. But it could just as easily never have come to pass. In ‘Tor’, Uli Hesse notes how team coach, Helmut Schön, felt he was looking at “a dressing room of doubting men” before the double-header with the 1966 World Champions, recalling how injuries to the likes of Weber, Vogts and Overath left a depleted squad, adding to the malaise felt by the Bayern Munich contingent; who had suffered debilitating defeats to Rangers (in the Cup Winners Cup) and Duisburg (in the Bundesliga). With the 20-20 vision of history, that all merely serves to enhance the legend subsequently enjoyed by the early-1970s side. And so to the ‘final’ tournament, and the semi-final match against the hosts Belgium(with the winners to meet either Hungaryor the USSR). Despite making notably heavy work of the home side, the dominance of the West Germans has since been acknowledged and well-credited by both sides. With Beckenbauer employed in his newly-ported deep-lying midfield playmaker role, the Belgians struggled to adapt their 4-4-2 sufficiently to shut down the space afforded to Der Kaiser, who was thus left to dictate the pace of the game. As a result, they frequently found themselves pulled out of position, allowing Jupp Heynckes and Erwin Kremer significant freedom on the flanks, and Netzer likewise in support of Müller. It was this pairing that would combine for the opening strike of the game, the latter heading home an inventive lob from the former with 24 minutes on the clock. It was at nigh-on the same juncture in the second half that the lead was doubled; the same duo coming together for Müller to steer home from close range on 71 minutes. And although Belgium had their chances – eventually pulling one back through an 83rd minute strike from Odilion Polleunis – the visitors’ ascendency was never really challenged. Just four days later, and the apparent failure to get into their stride in the semi-final showed no sign of being revisited as the West Germans lined-up against a USSR side that was itself a scant memory of the 1960s behemoth. The match bore all the hallmarks of the old adage of ‘the King is dead; long live the King’, as the West Germans veritably tore into their opponents. Bouyed by a new-found level of belief, the West Germans prowled the surface of the Heysel Stadium as if it were their own, and the opening goal never seemed too far away, eventually arriving through the reliable instep of Müller after 27 minutes. Half-time recorded West Germany as having enjoyed over 60% of the ball, and an equal territorial advantage. Within 15 minutes of the restart, it was all over; Herbert Wimmer netting the second on 52 minutes, and Müller rounding things off just six minutes later, to register the largest ever winning margin in a European Championship final. The harmony of the performance was summed up by Müller as the final whistle blew: “we understand one another on and off the pitch, and you can’t ask for any more than that. Everything worked”. The West Germans took six places in the overall Team of the Tournament, Beckenbauer, Breitner, Hoeneβ, Netzer, Heynckes and Müller lining up alongside four Soviets, and one Belgian. Gerd Müller took the Golden Boot with 11 goals across all stages (five in the post-Group phase), to go with his Europe-wide equivalent. Beckenbauer secured the European Footballer of the Year title, and the quintessential West German ascendancy and efficiency was spawned; thus to dominate the next decade. One of the greatest tragedies in the Bundesliga in recent times was the death of Hannover 96 goalkeeper Robert Enke. Kyle Barber writes a review of Ronald Reng’s book about the troubled German international. 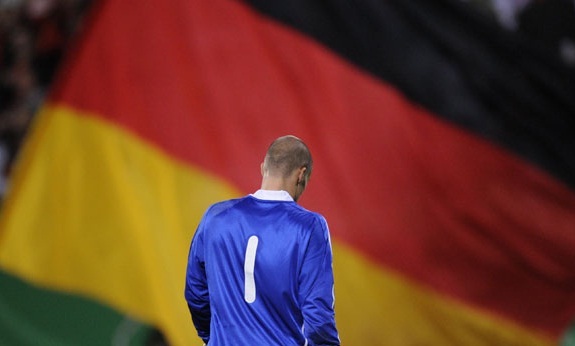 November 10th, 2011 marks the two-year anniversary of Robert Enke’s decision to take his own life. At approximately 6.15pm, the affable German international stepped in front of the Bremen regional express in the village of Eilvese. He was just 32, and left an adoptive child, devoted wife, and close circle of friends behind; consigned to an overwhelming void of emptiness. Within sight of that two-year mark, Enke’s story has finally been translated into English, courtesy of the eloquence of one of his inner circle – Ronald Reng. 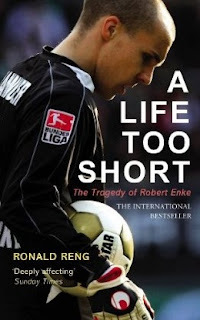 Through Yellow Jersey Press, ‘A Life too Short’ is a sombre, reflective accomplishment of the spiralling tragedy that was Robert Enke. While many people know something about the man, few will be fully aware of his life, career, and nuances of his story, much less the taboo of depression that has, since his passing, been far more widely embraced and addressed by German football, and German sport. In terms of his professional career, Enke was reaching his peak. He was established as the Nationalmannschaft number one – with eight caps and a seemingly nailed-on spot for the following year’s World Cup, was Club Captain at Hannover 96 (with almost 200 appearances behind him), and had been voted best goalkeeper for the 2008-09 Bundesliga season in what would be his last. He had had a successful three-year spell with Benfica, and been coveted by Europe’s elite – even receiving a call from Sir Alex Ferguson in 2002. He looked to have overcome an ill-fated season at Barcelona, and the decision to renege on a contract with Fenerbaçhe. Personally, he was wed to his soulmate and teenage sweetheart – Teresa, had a healthy, well-natured adoptive daughter – Leila, a close-knit circle of friends, and was well-liked and respected by his peers and community. He had overcome the death of his first child – Lara (who suffered with a degenerative heart defect from birth), and seemed content; even happy to those who thought they knew him. Those who truly knew him knew differently. So much of Enke’s life was regimented – even truncated – in nature; from his methodical precision to detail when it came to his gloves – two dozen pairs, with foam 7mm in thickness (1mm more than the norm), and the thumb seam on the outside to improve feel – through to the dates which book-ended his career and life – debuting on November 11th, 1995 against, of all teams, Hannover 96. Routine is certainly far from being an alien concept in any way, shape, or form for an elite athlete. But the interspersion of heartbreak he endured served in encouraging an introspection that darkened both him and his outlook on life. Through his personal relationship with Enke, Reng is able to offer a deeper, less evasive profile. Dipping beneath the veiled façade of both the stereotypical ‘professional footballer’, and that masqueraded by the man himself. He chronicles how Enke’s depression was both realised and yet controlled through regimen, though effused with an inherent love and care that the ‘keeper had to give – “At home, Robert cleaned his gloves with shampoo under the shower, laid them out to dry and stroked smooth the soft foam of their surface”, a routine he repeated after every game; win, lose, or draw. Ronald Reng himself is a multi-award winning author, and the effortless fluidity of his style is exceptionally reinforced throughout this text by a language that is both foreshortened and succinct. In-keeping with this approach, Reng is able to offer a portrayal that is not only vivid and true, but also helps encapsulate Enke’s mindset, and the micro-orbit in which he found himself constricted. It was that perception that manifested from around the age of 19, when he began harbouring the paradoxical fears of anonymity and of disappointing those around him. It was that dual spectre that would weigh on the East German’s broad shoulders for the best part of 14 years; his anxieties manifesting as depression – his Black Dog. Enke, though, became expert at using a tool pivotal to the cycle of depression. He became adept at presenting a serene front, a projected calm that betrayed his inner struggle. That illusion was unwittingly captured by his coach at Benfica – and now Head Coach at Bayern, the illustrious Jupp Heynckes – who described him as “calm, serenity, equilibrium, class”. At no point during the book does Reng ask that we sympathise with Enke. Nor does he seek to elicit empathy. Rather, and more credibly, he serves to present the man outside of the emotion, preferring to allow that feeling to infuse chapter and page. “It’s the goalkeeper’s torture – the constant demand on him not to make a single mistake….a goalkeeper must be able to repress things”: such is the cross which the final line of any team’s defence must bear. Yet Enke’s interpretation of this expectation led him inextricably to a degree of self-reproach and self-deprecation that was the harbinger for his disease to fester and grow. Enke developed a self-perception and mindset that meant he would distort events in a way that would always vindicate the subservience he felt. As Reng charts, Enke – from the age of 17 – had a “life divided in two” between professional football and everyday life. And it was that separation that leant well to the inherent kindness and tenderness that he repressed as a sportsman, but exuded as a human being (he would write poetry for Teresa; something wonderfully encapsulated by Reng to supplement the descent he captures, as we are taken from the buoyancy of a birthday prose, to the admission of how “he no longer felt the joy…the contentment that comes from writing down one’s thoughts” to annotate the burgeoning numbness that gradually overcame him). In the early years of his career, he was able to switch off, to compartmentalise the alternative aspects of his life without detriment to either branch. However, as the toils of trying to establish himself as meriting a squad place in his own right began to wear him down physically and mentally – coupled with the sense of isolation he felt through living away from everything he knew and loved – that balance shifted. Not in a tangible way, but in the psyche of a young man desperate to please, and to drink in all that he saw; Enke spent hours aping the mannerisms and techniques of the likes of Oliver Kahn, Edwin van der Sar, Uwe Kamps. In truth, nobody had higher expectations of, or put greater pressure on him than he did. And the lack of release, of escapism, began to blinker his outlook as he started to become his own prisoner. The fact that Reng opted to omit certain parts of that serialisation is testament to the strength of their friendship, his commitment to Robert’s memory, and in understandable deference to the emotions of his family. That he is still able to present an evocative, emotive reflection of a man lost in his own existence is credit to him. And it is with a sense of overt reticence that Reng prefaces his text by saying “Today I know why the [idea of writing a] biography was so close to his heart….he would finally be able to talk about his illness….Robert summoned up a huge amount of strength to keep his depression secret. He locked himself away in his illness”. 12 months ago, over 45,000 people attended a memorial service to one of German football’s most reserved, self-effacing and yet undoubtedly talented individuals as a nation collectively mourned. Today, the DFB, German football, and German sport in general, is amongst those most clearly attempting to embrace and address the taboos of depression. In penning ‘A Life Too Short’, and making it accessible to an English-speaking audience, Ronald Reng has dutifully honoured the memory and passing of his close friend with an air of sober eloquence and intuitive positivity. In doing so, he acutely captures the essence of how Enke lost himself to depression, forever trapped by a moribund sense of insufficiency and futility that he alone lived. This year, on November 10th, lend a moment of contemplation to the memory of a man who will forever be 32; who will forever be tormented; and who left a deep, reverent hole in the lives of so many. And – as Reng counsels – consider that, irrespective of what standing someone may have, or the subjective image they may portray: “Most depressives who attempt suicide don’t want to die, they just want the darkness that defines their thoughts to disappear once and for all”. Do not judge without consideration nor, in the Words of Guardian journalist Amy Lawrence, be so quick to castigate without pausing to wonder. Depression is an area of taboo equivalent to those of racism and homophobia when it comes to elite sport, and is swept under the carpet all too readily. But such is one of the facets of the disease of depression that it carries an element of Stockholm Syndrome about it too; with the prisoner harbouring a tacit comfort from the confines it devises for them. It can be seen as lending a security blanket through routine and fear of change. Enke thought, as most depressives do, that openly admitting to having a problem would be seen as a sign of weakness. That feeling was exacerbated by the cutthroat bubble of elite sport and, most likely, not too far from the sad reality at that time. What his death has done (‘achieved’ would seem too morbid a term to use) is open – just a little – the doorway for acceptance in today’s world. This weekend, the German National side take on Ukraine in a friendly. The players in that team will afford themselves a moment of contemplation in homage to the memory of their lost compatriot, and the whole of football should be encouraged to do likewise.